On Sunday, Jan. 7, thousands of people took their pants off on subways in over 60 cities in more than 25 countries around the world for No Pants Subway Ride 2018. Now, the event has been replicated across the globe. From London to Los Angeles, citizens from all over the world are baring it all for the community-filled commute. 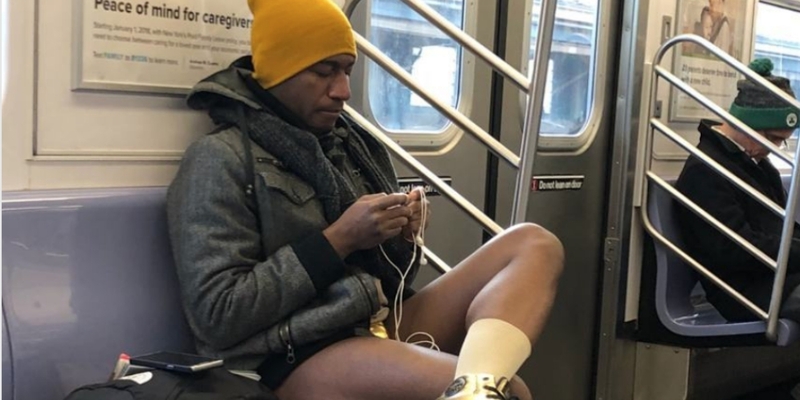 In New York City, the No Pants Subway Ride 2018 kicked off at 3:00 p.m. Sunday with commuters meeting at Union Station following the chilly journey. Mid-afternoon temperatures hovered around 17 degrees, with an additional 10-degree wind chill. Mike Pence’s hotter body double made an appearance last year and returned again for this year’s No Pants Subway Ride 2018, collecting money for charities who champion women’s health and LGBTQ rights. The No Pants Subway Ride NEVER disappoints. These two are perfection. Why hundreds of people would take their pants off and follow these asshats around…I have no idea!?!?! Happy #NoPantsSubwayRide or #NoPantsMetroRide or #Whatever! #Hashtag #BeachParty time #Damnit!